Key information and tips you need to help you understand the process of obtaining a copy of your medical records from your GP or a hospital and what to look for when you receive them. People want to view their medical records for all sorts of reasons. You may simply be interested in your past treatment, you may want to access someone else’s records or you may be concerned about the treatment you have been receiving. Remember, your medical records are confidential so only you, or someone you authorise, can access them. The process can however be daunting, so these simple steps will help you to ensure that you get what you are requesting as quickly as possible. There are all sorts of medical records including dentist, GP, hospital and optician. You will need to make individual requests to each organisation as there is no centralised system. Organisations such as GP’s and dentists tend to be relatively straightforward to locate as they usually have a main office location to contact. Remember, when you move GP practice your notes move with you so your current GP practice should hold all current and historical information, including things such as your Lloyd George Cards. Other organisations such as your dentist and hospitals retain your records, even when you move. It may therefore be necessary to contact a number of people to locate them. 2. Do you make a request in writing or informally? It is not always necessary to make requests formally in writing. If you want to see your records, or obtain a copy of them, firstly telephone or go and see the particular organisation and have a chat about how best to do this. It is often the case that, especially GP’s, will either let you see your records during a consultation, or make copies for you without completing any further forms. If this is not possible, submit your request in writing. State your name, address, date of birth and contact telephone number. It is also helpful to include details of any specific records you want, the dates of these and the treatment you received. You do not need to say why you want to see your records. If you are applying to a hospital, make sure you request copies all of your medical notes including radiological imaging, such as x-rays (if you do want these) as these often come from a separate department. Try and include as much detail as possible in your letter as this will help the hospital/organisation locate your records quicker. 4. How long do they have to respond? Under the Data Protection Act, they have 40 days to deal with your request from the date of your request or when they receive payment from you, whichever is later. If you have not heard from them by this time, telephone and chase for a response. 5. What are the fees for accessing medical records? There is a maximum fee of £50.00 that can be charged for providing copy medical records no matter how big the file of records is, and this includes any radiology. Please however check with the individual organisation as it is often less than this depending on how many records you are requesting. If the records you are requesting are held on computer only then the maximum fee is £10.00. 6. How long are records kept for? This depends on the type of record. GP records should be retained for at least 10 years after a person’s death. Each hospital will have different policies for how long they keep records so you will need to check with them if the treatment was several years ago. Children’s records should be kept until the child is an adult and sometimes longer. 7. What to look for when you receive your records? Each set of records is individual to you. 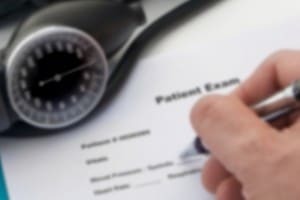 Generally speaking, GP and Hospital notes are likely to contain: clinical notes (hand written/computerised entries from your appointments); test results; nursing records; risk assessments; prescription charts; radiology/microbiology/pathology reports and incoming and outgoing correspondence. If you think you are missing something, please contact the organisation. Obtaining a copy of your medical records doesn’t have to be complicated and I hope this information will assist. Have a chat to the organisation and they will be able to guide you through the process in more detail. The Clinical Negligence Team are experienced in both obtaining and reviewing medical records. If you do require any assistance, please contact a member of the team for further advice.